I have often thought that if psychiatric drugs didn't have such potential to harm some people, i really wouldn't have a problem with them. As a civil libertarian, i don't consider it my business what people choose to put into their systems, as long as it harms no one else. But in regards to psych drugs, my approach has been based on the notion of informed consent- and people really do need to be informed properly before they are able to provide actual consent. The problem is that most people are not well informed. All that aside, if someone is suffering from chronic anxiety, research out this week demonstrates that the traditional Polynesian drink, Kava, is an effective treatment. Kava is a plant root extract which was traditionally drunk for recreational and ceremonial purposes in places like Fiji. It has a calming effect on the central nervous system, and as such can aid with anxiety and sleep problems. The reason for excitement about this is that Kava has far fewer adverse side effects than its pharmaceutical equivalents, such as benzodiazepines (eg. valium). In therapeutic doses, able to be taken in tablet form, it is far less toxic than the big pharma products. As such, when people are seeking a biological agent to help with anxiety, Kava is a viable natural alternative. But as with pharmaceuticals used to treat psychological issues, i would suggest it makes sense to treat emotional issues primarily with psychological approaches- otherwise, kava could just be used like any other substance, to simply numb a person to the causes of their anxiety. No one is anxious for no reason.The causes may reach far back into childhood or teenage experiences; or the causes may relate to unsatisfactory elements of life now- relationship problems, poverty, unemployment, poor housing, long work hours, etc. The key is to seek the causes- this the gives you a direction to pursue in terms of doing something about them. If anxiety stems from unresolved trauma, then some trauma focused psychotherapy makes sense (eg. see the EMDR page). If it stems from current issues, then some problem solving strategies make sense to address the problems. Kava may be a useful adjunct to psychological strategies if a person is feeling overwhelmed with anxiety symptoms. 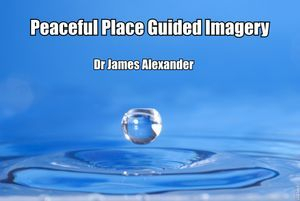 This guided imagery session takes you through a journey which helps you to use images from nature to assist your mind/brain to restore the much needed blood and oxygen supply to your pained body areas. Research shows that the functioning of the autonomic nervous system can be influenced by suggestion- in this case, suggestions which are focused on restoring the required balance of oxygen reaching your body areas which could be suffering from ischemia. 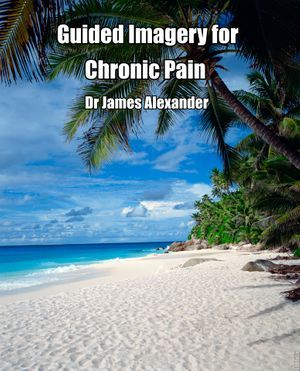 (As with all psychological interventions, please ensure that you have ruled out serious medical conditions which could be contributing to chronic pain before you entertain psychological approaches- a medical assessment is the best way to do this). This session, which runs for around 25 minutes, is accompanied by beautiful music created by Darshito. Click on the image to go the the Web Store and the session will be made available to you as an MP3 download. This guided imagery session uses natural imagery to help you regain some control over an over-active histamine response, which results in problems like hay fever. It invites you to consider emotional factors which could be contributing, and to imagine being treated with the most powerful anti-histamine which nature can provide. People often report that this session is an excellent 'circuit breaker' in the spiral of hay fever symptoms and increasing anxiety about the symptoms. This relaxation session invites you to go to a place in your imagination which is full of peace and tranquility. It can assist with the need to reduce your level of emotional and physiological arousal, and when used regularly, can act as an alternative to chemical forms of calming as your central nervous system gets more and more experience in just letting go. This guided imagery session is perfect for people who find that their mind is full of busy activity when they are wanting it to settle to allow sleep to occur. The mind will often require a focus of attention to divert it from all the worries of the day. 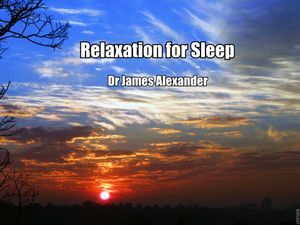 This session takes you into places of natural beauty, and involves 15 minutes of calming talk about sleep, followed by more than an hour of relaxing nature sounds and beautiful music conducive to sleep. It is an excellent addition to your phone or MP3 player, allowing you to listen with ear plugs in bed at night. Bi-lateral stimulation has been demonstrated through extensive research on EMDR to induce a calm physiological and psychological state. 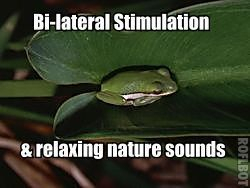 This recording uses sounds from nature, some of which alternative between the left and right channels, to create the bi-lateral stimulation effect. It requires left and right ear-phones when listening. The use of bi-lateral stimulation sounds can assist in self soothing as well as in psychological processing of lesser serious psychological distress.